There is a natural element of magic built into Macbeth. Witchcraft plays an integral role in the plot as it aids in the future Scottish king's madness. 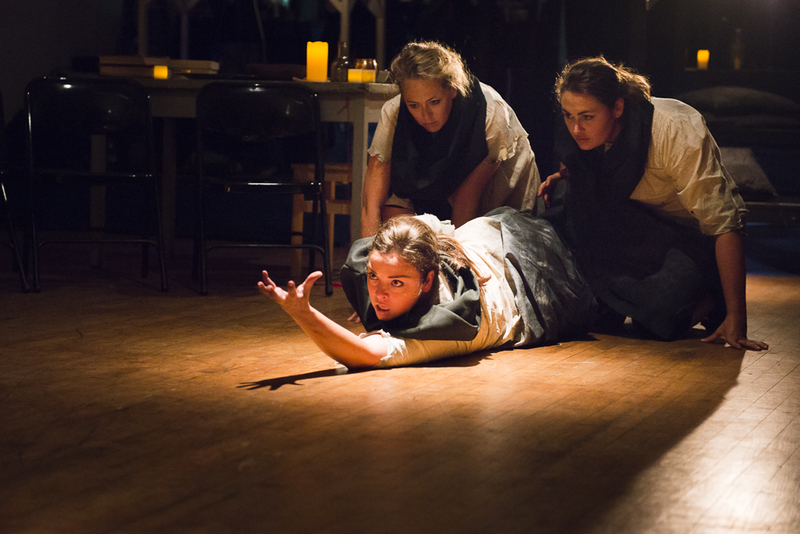 In The New Collectives in association with Wandering Bark Theatre Company's haunting The Witches, the lens of the Shakespeare drama is through a séance that maneuvers through the action in a revealing manner. Adapted and directed by Valerie Redd inspired by an adaptation from Eric Powell Holm, The Witches is a daring take on Macbeth that keys into the darker elements. Condensed into a sharp ninety minutes and told with six actors, The Witches is a haunting adaptation just in time for Halloween. Redd keeps the action consistent, seamlessly weaving in and out of witchy ritual and Shakespearean text. Bringing the audience intimately into the action via a séance circle of seats, the drama unfolds inches away. The conceit of a séance is striking and fascinating. As warned, possession could happen to anyone and when it does, the intrigue raises immensely. But it takes a cue from Fleance and suddenly flees. Though there was a ritual ruler that played an integral part of the evening’s actions, keeping the other three witches on stage once they are summoned to keep the séance vibe alive and then having three other “actors” possessed to play the other roles could have been another dynamic approach. Regardless, the conceit was captivating. Not every actor is equipped to do Shakespeare. Fortunately, the ensemble of The Witches was more than capable. The sextet tackled the dialogue with ease. While Macbeth is the focal character of the source material, it was the witches in this production that stood out. They were in sync as a unit but when they broke out into characters, they shined individually. The soulful Giverny Petitmermet captured the robustness of Lady Macbeth. Petitmermet’s resonance gave the character much power and passion. Sarah Moore easily transformed from witch to character. Moore was a utility player when it came to the Shakespeare but when she took on Lady Macduff, her cry was fervent and empowering. Mara Gannon, like Petitmermet, has a resounding vocal quality that worked wonders in this world. Gannon’s witchy transformation was effortless. Valerie Lonigro took on the role of the leader of the séance. As our introduction into this world, Lonigro evoked the spirit of the production. By simply calling the spirits and guiding the evening, Lonigro was mesmerizing to watch. Knowing the action allows you to veer over and watch the intricacies of Lonigro’s performance. Dan Morrison as Macbeth started his performance quite internal. It was a strong and interesting choice but when he began his decent into madness, Morrison came to life. As Banquo, Sam Leichter played a wonderful supporting role, going full force with blood. The Witches is a very detail-oriented production. Every single moment, item, and movement was skillfully calculated. The preshow ambiance was so striking, the audience was afraid to talk. With Lonigro meandering around the stage and the creepy soundscape from Kevin Novinsky, the moment you entered the room, the play was on. Though more underscoring throughout the evening would have added even more ambiance and terror. There was great attention to detail used in Anastasia Romantsova’s scenic design. From a shelf of bloody jars and tables filled with witchy accouterments, each item was important. Redd’s use of Romantsova’s props for Lonigro’s Novitiate was well thought out. Lighting designer Michael McGee utilized unnatural lighting angels to create fascinating stage pictures. Macbeth has been done to death but when a new perspective is granted, it can be rewarding. The Witches is a striking production that tickles the horror-lover in us all.